This is the 20th anniversary of Canada B looms. It Runs from March 11th through the 20th.The event has, in the past couple of years, been moved from the Convention Centre in downtown Toronto to the Enercare Centre at the Exhibition Grounds, just west of the City. There is ample parking and if you are going to go to Toronto for a couple of days there is a streetcar that goes right to the back door of Canada Blooms. The main draw, of course, would be the magnificent gardens that will be created. It is amazing to see them, some as large as 40 x 30 feet, that is 1200 square feet, the size of a nice Auburn backyard. Of course there are smaller gardens. All are fully landscaped, not only with lawn and flowers, but with magnificent trees, many in full bloom and certainly in full leaf. There are completely constructed patios and verandas. Terry said that this year there is an emphasis on lighting. The garden areas are on a schedule to have the overhead lights dimmed at times to get the full effect of the lighting of the gardens. I assumed, and he agreed, that as the last time I visited, there would be water features. 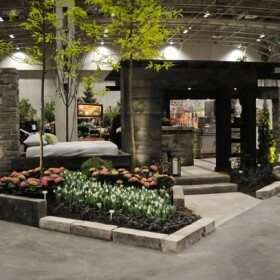 I did ask why landscape firms, and they are large firms, spend so much money to be at this show. I knew the answer but he confirmed it. Thousands of people visit the event every day and it gives those firms an opportunity to show what they can do. These are not companies who specialize in replacing a few shrubs around the house. These are major firms that install whole gardens and outdoor living areas from the stonework and wood work to the plants and outdoor kitchens. This is an opportunity to put their best foot forward and make contacts. 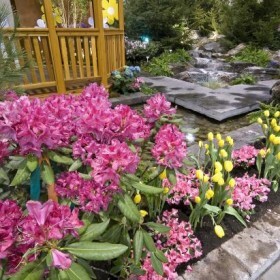 Terry said that some gardens can take as long as 8 days to set up, a few as little as 2 or 3. It depends not only on the size of the area but the intricacies. Then I asked Terry about keeping it all fresh. He said it was easy. All flowers and plants are replaced when they even start to look shabby, but all flowers and most flowering plants in the garden exhibits are simply replaced at the end of the 5th day. There is nothing they can do if a tree starts to look bad, but that seldom happens. As with any garden show there are competitions. As I remember, the houseplants displays were beautiful. I can just imagine that the exhibitors had not only outdoor gardeners, but someone to look after the plants in the home greenhouse and living room. I always found the orchid section especially appealing. The flower arrangements, I think a different competition each day, are lovely. But, I think that the section that intrigues me most is the miniature competition. You just cannot imagine what good designers can do, how much detail they can include in arrangements that are only 6 or so inches tall. I marvel at what they do. Then, there is, of course, the selling section. There is a very large hall with vendors of every tool, accent or plant imaginable for the garden. A bit of a warning though. Taking plants across the border is a no-no. It is illegal. They will be confiscated if found. So, best to spend your money on new tools, gadgets and garden accents. 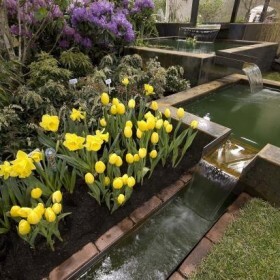 And for the most serious among us, there will be 3 stages set up and going all through the show with speakers on various garden issues, floral designers showing off their talents and more. I am going to drive up to Toronto in the middle of the week of the show, Tuesday I believe. I am going the evening before because I want to be at the exhibition at 7:30 in the morning for a pre-opening tour. I’ve always done that because when the show opens at 10 the crowds pour in and you just do not get time to contemplate each thing of beauty. This entry was posted in Garden, Plants and tagged beautiful flowers, Cosentino Florist, horticultural, horticultural therapy, perennial flower bed, Plants, Society of American Florists. Bookmark the permalink.